In his Confessions, Saint Augustine reflects upon his life in the light of scripture and the presence of God. He begins with his infancy, pondering the many sins of his life before his conversion, and he confesses not only his sins but even more the greatness of God. This work presents a wonderful contrast between the Holy God who created all things and whom heaven and earth cannot contain, and a commonly sinful man who has joyfully received God's loving salvation and mercy. 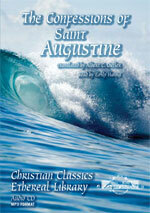 Many scholars consider Saint Augustine to be among the greatest and most influential fathers of the early church. And as you read his Confessions, you will find the confident humility that is common among those whom Jesus calls "great in the kingdom of heaven." Augustine writes as a common man, and so his words span time and tradition. May his Confessions guide you to the One whom he confesses. The Confessions are not Augustine's autobiography. They are, instead, a deliberate effort, in the permissive atmosphere of God's felt presence, to recall those crucial episodes and events in which he can now see and celebrate the mysterious actions of God's prevenient and provident grace. Thus he follows the windings of his memory as it re-presents the upheavals of his youth and the stages of his disorderly quest for wisdom. He omits very much indeed. Yet he builds his successive climaxes so skillfully that the denouement in Book VIII is a vivid and believable convergence of influences, reconstructed and “placed” with consummate dramatic skill. One does not read far in the Confessions before he recognizes that the term “confess” has a double range of meaning. On the one hand, it obviously refers to the free acknowledgment, before God, of the truth one knows about oneself--and this obviously meant, for Augustine, the “confession of sins.” But, at the same time, and more importantly, confiteri means to acknowledge, to God, the truth one knows about God. To confess, then, is to praise and glorify God; it is an exercise in self-knowledge and true humility in the atmosphere of grace and reconciliation. The sensitive reader soon recognizes that Augustine will not willingly be inspected from a distance or by a neutral observer. In all his writings there is a strong concern and moving power to involve his reader in his own process of inquiry and perplexity. There is a manifest eagerness to have him share in his own flashes of insight and his sudden glimpses of God's glory. Augustine's style is deeply personal; it is therefore idiomatic, and often colloquial. Even in his knottiest arguments, or in the labyrinthine mazes of his allegorizing (e.g., Confessions, Bk. XIII, or Enchiridion, XVIII), he seeks to maintain contact with his reader in genuine respect and openness. He is never content to seek and find the truth in solitude. He must enlist his fellows in seeing and applying the truth as given. Even the best of Augustine's writing bears the marks of his own time and there is much in these old books that is of little interest to any but the specialist. There are many stones of stumbling in them for the modern secularist--and even for the modern Christian! Despite all this, it is impossible to read him with any attention at all without recognizing how his genius and his piety burst through the limitations of his times and his language--and even his English translations! He grips our hearts and minds and enlists us in the great enterprise to which his whole life was devoted: the search for and the celebration of God's grace and glory by which his faithful children are sustained and guided in their pilgrimage toward the true Light of us all. My Confessions, in thirteen books, praise the righteous and good God as they speak either of my evil or good, and they are meant to excite men's minds and affections toward him. At least as far as I am concerned, this is what they did for me when they were being written and they still do this when read. What some people think of them is their own affair [ipse viderint]; but I do know that they have given pleasure to many of my brethren and still do so. The first through the tenth books were written about myself; the other three about Holy Scripture, from what is written there, In the beginning God created the heaven and the earth, even as far as the reference to the Sabbath rest. The narration is by Emily Hanna, a professional theatre student at Calvin College in Grand Rapids, Michigan. The cellist is Peter Plantinga and the audio technician is Gerard VanHalsema. You can listen to a sample of the recording. Your purchase of this CD helps fund the further development of the Christian Classics Ethereal Library. Compatibility: You can play this CD in your MP3-compatible CD/DVD player or computer. This CD will NOT play on a standard CD player. For questions or additional product information, please contact us. Don't want to purchase through PayPal? Would you prefer to order by mail? Use the CCEL Products order form.